Two McMaster students and one faculty member have won John C. Holland Awards, which celebrate the contributions of African Canadians to the economic, cultural and social life of Hamilton. Sonia Igboanugo, a student in the Biomedical Discovery and Commercialization program who founded the Black Aspiring Physicians of McMaster and launched the BAP-Mac Mentorship program, received the Lincoln Alexander Scholarship. Salsabil Sarhan, a first-year social sciences student, won the Marlene Thomas Scholarship. And Gabriela Roberts, an active member of Nu Omega Zeta, Canada’s first all-Black Greek sorority, won the Evelyn Myrie Political Action Bursary. Mark John Stewart, president of FlyPrint global strategy and marketing consultancy, teaches strategic management in McMaster’s Master of Communication Management program. He is also the chair of Empowerment Squared, an organization that empowers newcomer and marginalized youth and communities in Canada and globally. Stewart won the Business Award. In total, 15 Hamiltonians won awards at the gala held at Liuna Station on February 2. The annual awards are named after John Christie Holland, a pastor at Stewart Memorial Church in the 1930s and 1940s who was active in humanitarian causes in Hamilton. In 1954, Holland became Hamilton’s first Citizen of the Year – the first African Canadian to receive that honour in any community in Canada. Two McMaster students and one faculty member have won John C. Holland Awards, which celebrate the contributions of African Canadians to the economic, cultural and social life of Hamilton. <strong>Sonia Igboanugo</strong>, a student in the Biomedical Discovery and Commercialization program who founded the Black Aspiring Physicians of McMaster and launched the BAP-Mac Mentorship program, received the Lincoln Alexander Scholarship. <strong>Salsabil Sarhan</strong>, a first-year social sciences student, won the Marlene Thomas Scholarship. 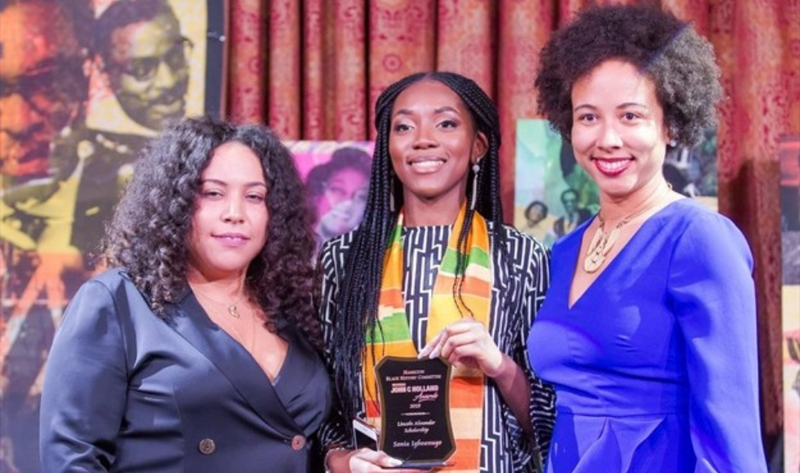 And <strong>Gabriela Roberts</strong>, an active member of Nu Omega Zeta, Canada's first all-Black Greek sorority, won the Evelyn Myrie Political Action Bursary. <strong>Mark John Stewart</strong>, president of FlyPrint global strategy and marketing consultancy, teaches strategic management in McMaster’s Master of Communication Management program. He is also the chair of Empowerment Squared, an organization that empowers newcomer and marginalized youth and communities in Canada and globally. Stewart won the Business Award. In total, 15 Hamiltonians won awards at the gala held at Liuna Station on February 2. The annual awards are named after John Christie Holland, a pastor at Stewart Memorial Church in the 1930s and 1940s who was active in humanitarian causes in Hamilton. In 1954, Holland became Hamilton’s first Citizen of the Year – the first African Canadian to receive that honour in any community in Canada.